eBlueJay: 1,500 American Persimmon Seeds- Fresh And Ready For Planting!!! On Hold 1,500 American Persimmon Seeds- Fresh And Ready For Planting!!! 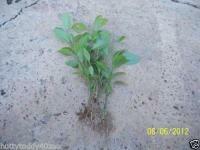 The bidding special for today is 1,500 American Persimmon Seeds. I have carefully washed and cleaned the seeds, which I saved after I process the persimmons to remove the pulp for use during the winter months. These are fresh seeds that were harvested from this years crop of persimmons from the tree that is in our front yard. I have cleanly picked and removed the seeds from the persimmons, then drying them prior to listing them. I have been keeping the seeds safely packaged up. You will be receiving 1,500 seeds, like those that are pictured above!! Persimmons are easy to grow, as they require plenty of sunlight and good-to-moderate soil drainage. The persimmon trees grow slower than most other fruit tree species, but they can often begin bearing fruit at an early age. The fruit of the persimmon tree has very few pest or disease problems and can very easily be grown in most areas without the need to be sprayed. The seeds can be easily planted outdoors in late fall, where they will cold straitfy during winter, and be ready to begin growing in spring. This is the method that I used when planting some seeds around various locations in our yard, earlier in the year and every seed that we planted has already began growing. A layer of mulch to the soil surface around each persimmon tree, extending out to the outer branch spread for the first five years after planting, will help to reduce weed competition and helps maintain adequate soil moisture. The younger trees are prone to dropping their small developing fruit, especially during a period of drought. 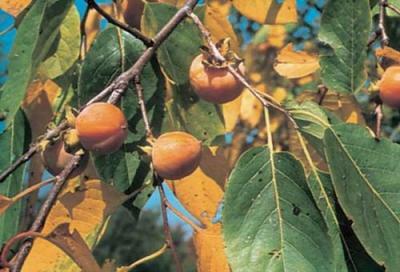 Persimmon trees provide good fall leaf color in the fall and offer shade in the summer. After the leaves have dropped from the branches, the reddish-orange colored fruit continue to remain on the tree for several more weeks. The name persimmon, also refers to the tree's globe-shaped, spicy-sweet, yellow to reddish-orange colored fruit. The fruit of the persimmon tree, may have several large, flattened seeds. Persimmons are high in vitamins A and C. Persimmons can be eaten fresh, stewed, made into cookies, or cooked into jams or puddings. To help remove some of the astringent taste from persimmons that may not be completely ripened, you can simply place them in the freezer overnight and then allow them to thaw out, it will help remove the pucker from the persimmon fruit faster. A fully ripened persimmon has a sweet candy-like taste that is such a wonderful treat to enjoy..... one of nature's candies as I love to call them. The fruit of the persimmon tree will appear to be, nearly rotten-looking when they are fully ripened. If you eat them prior to be fully ripened, you'll be in for an unpleasant astringent surprise. They also make a great way to enjoy some tasty recipes that require persimmons as an ingredient. Great way to not only make your yard more inviting for wildlife, but to also enjoy the fruits of what your persimmons trees grow. It's not too early to think about next year's gardening line-up. What a great item this would make for an inexpensive gift for that special gardener. There are plenty of seeds to grow for yourself and share with neighbors, family, or friends who enjoy planting and gardening from seeds. Thanks for viewing our listings and May God bless!! Please keep checking out our listings, as there will be more to come in the weeks ahead. HAPPY e-BAYING! !